Just two weeks after terrifying video of a bloodied United Airlines passenger who was violently kicked off a flight for refusing to give up his seat went viral, another video has emerged showing an American Airlines employee challenging a passenger to hit him after a woman holding a baby was allegedly hit with her stroller in an argument with airline staff. The video starts with the woman already crying at the front of the airplane, holding a child in her arms and asking for her stroller back. 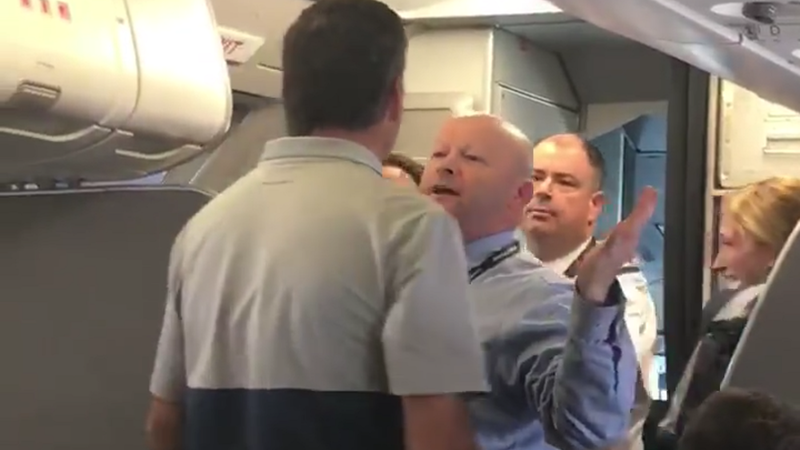 You can hear another upset passenger say he’s “not going to sit here and watch this...” before making his way to the front of the plane to confront the flight attendants and ask for the name of the employee that allegedly hit the crying woman. Another woman, seemingly a passenger, also confronts the airline staff about the situation. ﻿OMG! AA Flight attendant violently took a stroller from a lady with her baby on my flight, hitting her and just missing the baby. Then he tried to fight a passenger who stood up for her. AA591 from SFO to DFW. What’s going on with these American Carriers??? It’s unfortunately unclear exactly what happened before the video starts, but it is clear from the reactions of the passengers and the crying woman holding the child that there was a serious incident. The video’s poster, named Surain Adyanthaya on the Facebook account, claims the woman was hit by the male employee as he took away her stroller. Another post on the same Facebook account is an image of the woman, with two children, seemingly being escorted off of the flight. The post claims that she was involuntarily removed and the aggressive employee was allowed back on the flight. The flight number listed in the Facebook posts is for flight AA 591 from San Francisco, California to Dallas/Ft. Worth, Texas which departed at 2:18 p.m.—about an hour after its scheduled 1 p.m. departure time. On April 10, video of a bloodied man went viral after he was forcibly removed from a United Airlines flight that was overbooked. As police escorted the passenger off the flight, they broke his nose and knocked out two of his teeth, it was later revealed. United Airlines CEO Oscar Munoz then stumbled through a series of tone deaf statements. Prior to that, United Airlines had come under fire for refusing to let two young women board a flight for wearing yoga pants. ﻿We have seen the video and have already started an investigation to obtain the facts. What we see on this video does not reflect our values or how we care for our customers. We are deeply sorry for the pain we have caused this passenger and her family and to any other customers affected by the incident. We are making sure all of her family’s needs are being met while she is in our care. After electing to take another flight, we are taking special care of her and her family and upgrading them to first class for the remainder of their international trip. If you were on this flight and would like to contribute to this report, please email tips at jalopnik dot com with proof you were on the flight and any further information on the incident seen in the video. ﻿Olivia Morgan was standing in the doorway of the aircraft with her 8-year-old daughter waiting to board when the altercation happened. ﻿Watson said the flight attendant’s tone was “aggressive” and the woman was refusing to let go of the stroller, which escalated the situation. This post has been updated to clarify that the woman was allegedly hit with the stroller in the incident that occurred before the video begins.